That, sir, is glorious. I applaud your ingenuity in creating such a beautiful conversion, and take my hat off to your vision and skill in executing it. The banner as a loincloth is simply brilliant. And, sure, he is an honorable man." Good idea! Maybe have a Grey Knight standing under him pointing at something for the Dreadknight to attack? Like he's it's master? Hmmmm interesting idea! If you ever played Might and Magic VI, I was thinking the scene in the intro where the ghost 'breaks out' from the barbarian's body... only a power armoured grey knight ghost emanating from the riderless Dreadknight. *Blush* Thanks. But to be honest (and honourable?) I did a lot of reference material searching on google before I decided how to do what I wanted to do. Hmmm, Varakir I'm not not sure which lightning you are refering to... The 'arcs of electricity' on the pistons (Jump kit?) at the back or the detailing on the armour? Honestly, I'm totally guilty of this as well. Especially on your Log, there are plenty of pretty pictures there to be distracted by. Having said that, I think you are right even if it isn't lightning. I've painted it base gunmetal, Asurmen Blue wash, Leadbelcher layer and then Mithril Silver paterning, but I almost feel like I should have either green stuff'd the pattern (too hard for with my current skill, honestly) or done something different with the paint... either source lighting or using a Devlan/Badab combo and relayering metalics to give it more depth and 'age'. How would you suggest doing it? Well Swede, no 'fresh' ideas yet sorry, but I do have a cupboard full of terrain that is luring me with its siren call (also I need to not spend quite so much money on plastic spacemen at the moment) so you never know. I am childishly excited to get this going. 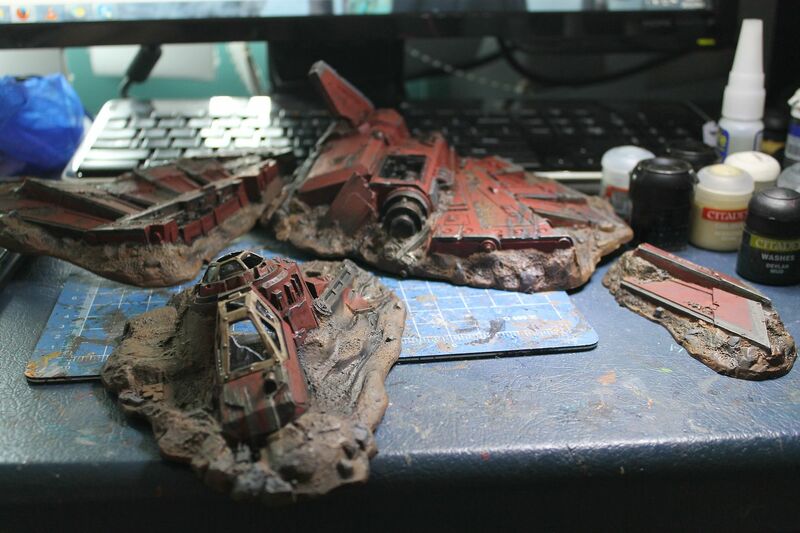 I did have to hide that leviathan crusader though, because I actually do not want to start that until I have my hands on an airbrush. Ah the crashed Aquilla lander. 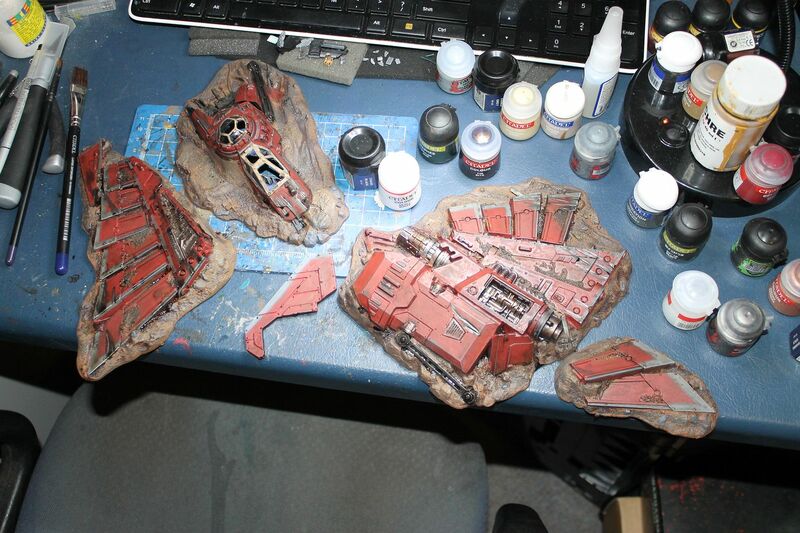 That is the only piece of terrain GW has ever produced that I've ever wanted to get. Are you going to assemble it as is or combine then all? I think the technique is fine, just the patterns are not intricate enough. The detail is quite sparse and spaced out on your dreadknight, so it naturally draws the eye as something that stands out. If you had covered the whole surface with lots of swirly patterns (like on the gauntlet) then it becomes less obvious, and the eye is drawn to the more prominent features like the banner. 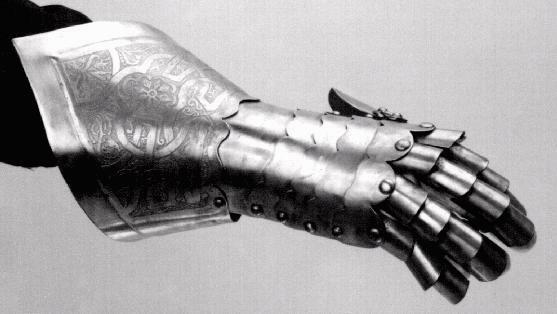 It'd be a pretty daunting task to get those kind of details down on the armour though - i'm not sure i'd even attempt it and probably just leave them plain silver. I do really like the idea though and i think it'd be fun to try out. 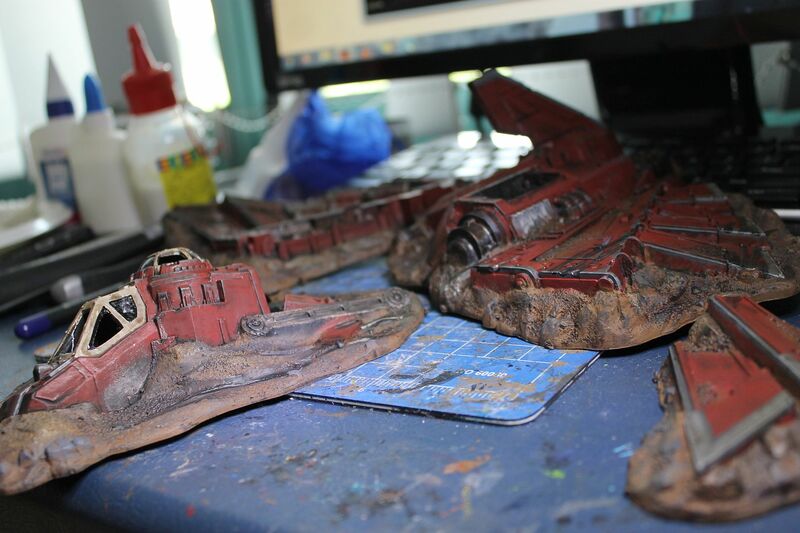 Also, i am insanely jealous of your crashed ship BFM scenery. I keep looking out for cheap 4th edition sets but no luck yet! Use a dark grey or even Black as a base layer for the vines and then just go over with a fine layer of metal color of your choice and the whole thing should pop more. It would certainly add depth to the model. You can take it a step further and Base the outline with Black. then a darker grey to bring the intensity down a bit from the black and then finally lay down a chainmail/ mithril silver equivalent. 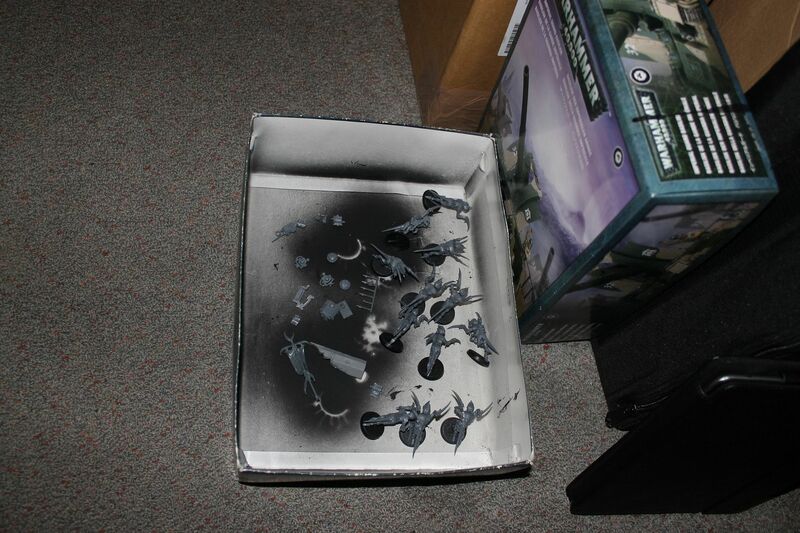 (or go with a lighter grey for more of a NMM effect. Other than that Its a gorgeous Model Mate im not sure id be able to pull that off as well as you have. I did consider this, but after much finger gnawing I decided I didn't have time this month to figure out how to make it look right. I'd have needed to reflect the 'wreath' and eucalyptus leaf in the pattern to make it fit with the other models, but unlike them I've put two lines of pattern on each surface instead of one. It looks... not crowded. I was scared to change that, I guess. Use a dark grey or even Black as a base layer for the vines and then just go over with a fine layer of metal color of your choice and the whole thing should pop more. I definitely considered this swede. I have toyed with NMM effect before with... limited... success (I think I need more blending skills and patience to pull it off). I decided not to black base to try and give a consistency to the model... It sounds a bit pretentious when I've not been skilled enough to pull off the really fancy etched look, but I wanted the armour to be one piece of embellished armour without giving too much 'embossing' to the pattern. Are you going to assemble it as is or combine then all? I start a grey knight heavy log, and then waste a forum opportunity by not including in it my 666th post! Dash and blast! Last edited by Iraqiel; 11-26-13 at 03:42 PM. Some people glue all the pieces together in a no scattered version, one guy won a gold at golden deamon for it years ago. Not as practical as you say though. 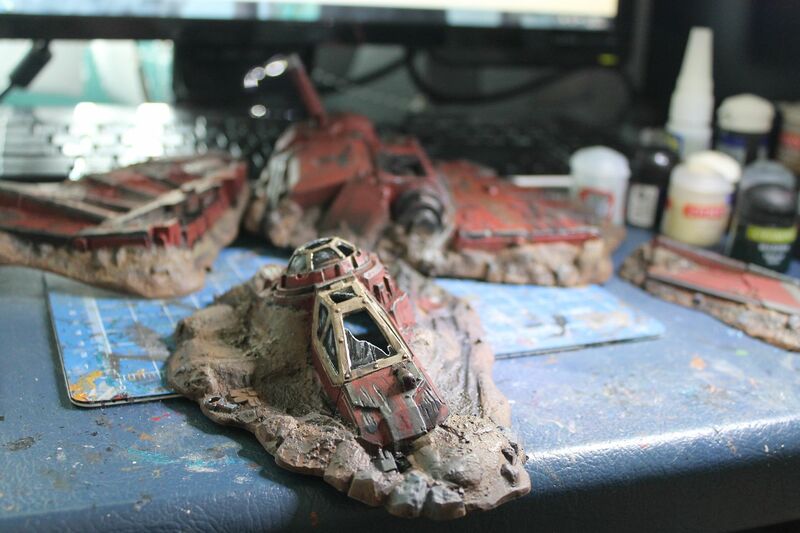 Ok, keeping it simple so that I can game with this terrain this weekend... possibly tomorrow. Possibly after a work function. Possibly I don't want to do any immaculate detailing in case something unfortunate happens to them, as it has before happened to the odd mini knocked or dropped onto the floor. And stepped on (accidentally). Still, I'm pretty happy with how it turned out, for tabletop standard it was fairly quick to knock out. 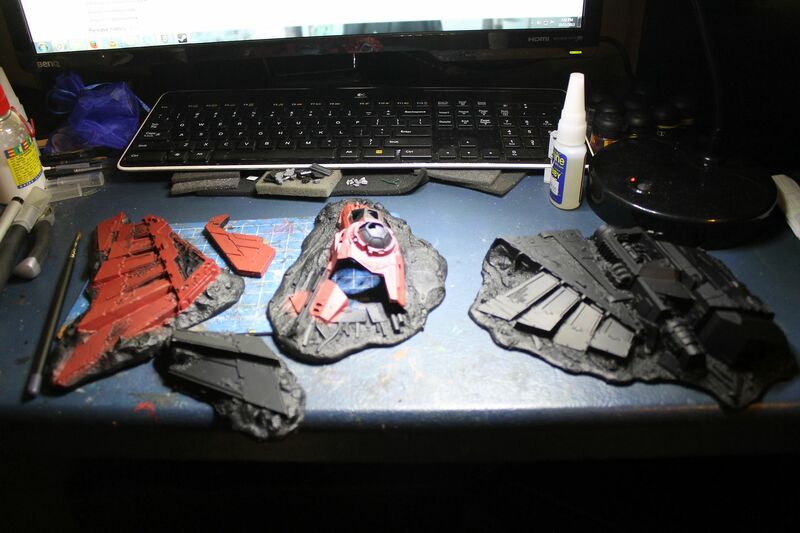 Now, to basecoat those gaunts and prep next month's challenges. With the amount of drinking I've got to knuckle down and do this month, I'm not sure I'll be able to finish anything else this before December.